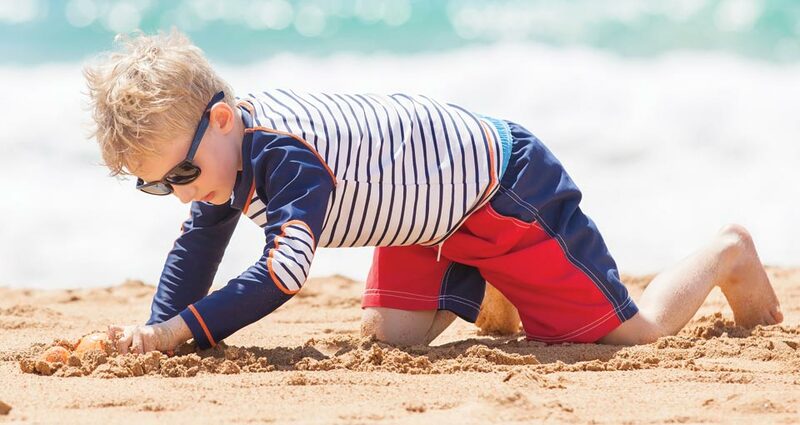 Whether you love playing on the beach, fishing on a local pier or hitting the amusement park in Florida, you need to rely on some basic sun safety tips to help protect your children. Keeping them safe at a younger age will help develop habits that will reduce their risk of developing skin cancer later. Use these tips every time you spend a few hours outside with your kids. Even if you already know that your kids should wear sunscreen, you may not realize what type you should use or how often you need to reapply it. You should choose one with an SPF of at least 15, although those with sensitive skin will need a higher SPF of at least 30. Colored sunscreen products let you see where the lotion goes and if you missed any areas. You should reapply sunscreen at least once every three hours. If your kids spend a lot of time running around and playing, you should reapply it every two hours. Products designed for use in the water need further applications during the day. The Sun Safety Alliance recommends limiting the amount of time you spend outside between 11 a.m. and 4 p.m. These hours are when the sun’s rays are the strongest and the harshest. If you do spend time outside in the late morning and early afternoon, make sure that you take frequent breaks. Try to spend time inside in the air conditioning a few times during the day. You can sit under a tree or an umbrella and spend a few minutes in the shade every hour to escape the sun. Choosing the right clothing is one of the most important sun safety tips. Darker clothing, shirts with long sleeves and long pants are generally best. You can find kids’ apparel that fit your kids comfortably and won’t slow them down. Choose additional accessories that will your kids even more protected. Sunglasses designed to fit smaller faces with UV protection prevent damage to their eyes while hats can keep their heads safe. If your children are on any prescription medications, always talk to your doctor before planning a day trip or spending time outside. Certain medications may make their skin more sensitive to the sun’s rays and cause significant damage, especially medications for acne and some antibiotics. Children often want to be just like their parents. If you want them to stay safe in the sun, lead by example. Covering up while out in the sun, wearing sunscreen and taking shade breaks will help develop similar habits in your kids. Using some basic sun safety tips will keep your kids safe from the sun whether you’re at the beach, out on the boat or playing at home. For all your sun safety needs, from sunscreen and performance gear clothing to sunglasses and hats, head to Coastal Outfitters today. If you have sun-protection tips of your own, comment below.